Styled with jeronimo tank and theodore trench coat . Styled with subah t-shirt . Styled with subah t-shirt , jeronimo tank and theodore trench coat . One of our most-loved pieces ever. These leggings are made with an innovative vegan leather from Japan that's supple, incredibly stretchy and contours to your body without bagging out. Looking for something cropped? Check out the Daria in an ankle length here. I have a smaller waist and bigger thighs/hip and these slide down on me so bad! I find myself pulling them up at constantly as soon as I start moving around. If you're going to get them, walk around the house a bit before you take the tags off to make sure they fit you right. Looks great, but I just don't reach for them much. The pants are stretchy and snug. Putting them on the first time required some gymnastics but they stretch and are comfortable. The ankle pants are long enough but I sized up. These are my favourite pants of all. You can dress them down with a sweater and sneakers or dress them up with heals and a flowy blouse. Everyone needs a pair of these in their closet!Best part is that they are machine washable. Absolutely love these pants! I have gotten so many compliments on them! The fit is true to size! Only thing is they are a little Long but I’m 5’2” so I’m used to pants never fitting just right! I just roll them under and that does the trick! So happy with my purchase! They are also so soft and very sliming! Really nice fit, so comfy! I also like the fact that they are light and airy so they don’t make you sweaty. I ended up sizing up because my regular size felt a little snug. Overall very pleased with them! I love the Daria pant! I find them so versatile - I have them in multiple colours, materials and lengths, and they never disappoint. I find they're true to size no matter which version I buy. I'm typically not into tight pants/leggings, but these are so flattering! I have been wearing these for 4 years and I’m obsessed! They last forever, and just re-ordered. Everyone needs these!!! The first pair I got were an M, but after a couple of wears, it stretched out a lot. I'm in my 20s and I usually wear a 28-29 in jeans, and the S fit perfectly on me. If you're deciding between two sizes and prefer a glove-like fit, size down. It is totally worth the wait as they will mould to your body after a couple of wears. The panels around the waist are super flattering, the construction and quality are superb, and nothing else compares to them. Normally wear a size xs or 25 and had to get three different sizes before finishing with the xxs. The pant does stretch out quite a bit so make sure they are challenging to out on at first, they do loosen up within 10 min and will then fit like a glove. I find because I have a small waist that even though they are tight and fit really well, as soon as I bend over or crouch down they slide down me, and I find myself pulling them up a lot. I have really long legs, so I always struggled finding pants. These are perfect and keep their shape. Really like the material of the pant. Fit just a little bit small. Very flattering. Really comfortable. I usually wear an xxs/xs, but ended up with a small even though they have a lot of give. Went with the full length vs crop bc the crop kind of flared out at my ankles, so I just tuck the full length ones under a bit to adjust the length and they’re perfect! This is my second pair of these pants - the first pair I had has finally started to wear out in the thigh area due to wearing them so often and owning them for around 5 years. Well worth every penny! They wash great, they are so comfy, and they look great with a multitude of outfits. I highly recommend these! Best pleather pants I’ve found to date! Love how they are higher waisted, are nice and long, and stretch. Supper cute and comfy. Love - can dress them up or down. Nice easy to wear pant! They fit beautifully around the hip, waist and in the crotch length. It is only the legs which I think could be a bit tighter and shorter. They’re a great pant for many occasions with many tops. They are too long for an a average gal who doesn’t care for ankle length. I saw a friend of mine wearing these one night and she told me where to find them. 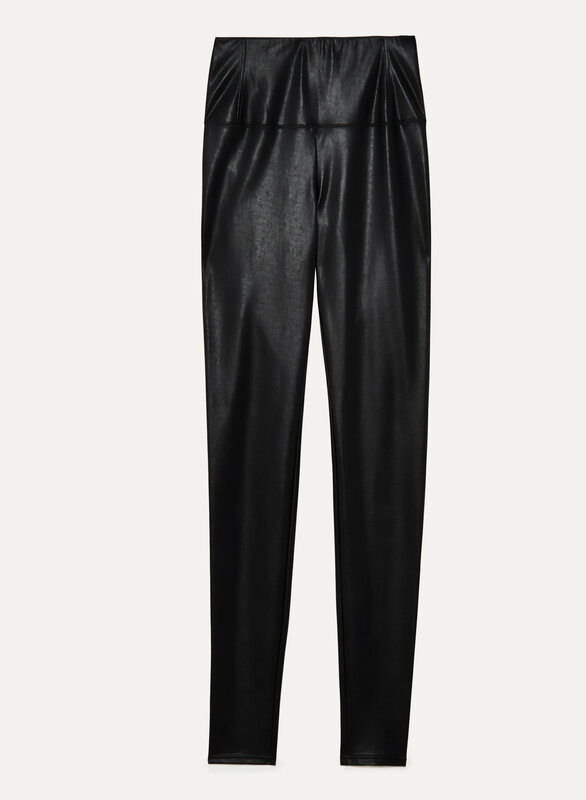 I've been looking for the perfect leather-look pants forever and these are definitely the ones. Can be worn with anything. I ordered S which is my usual size for bottoms but I couldn't get them on higher than the knees. Exchanged them for M and they fit very tight. I love them. They are super soft and the leather is beautiful. Pants have a slight stretch and will give 1/2 a size. High rise, but back seems to slide down a bit when you sit. Noticed that the seams at back have stretched but don’t appear to be at risk for a tear. Looks very sleek. Length is perfect for taller people!